In the United States, flooding is the most common and costly disaster that affects every region and state. However, what most homeowners do not realize is that flooding is not covered under a typical insurance policy. Only flood insurance covers the damages caused by rising waters. However, there are certain situations where flooding is covered. This article will go through the ins and outs of flood coverage. If a homeowner keeps their washing machine, a refrigerator, or an AC unit in the basement and they malfunction they could cause some flooding. If they malfunction and flood the entire room, then the damages are typically covered in a standard policy. Some insurance companies will try to argue that the flood occurred because of lack of maintenance. If they can prove that the appliance was not well maintained, then they will deny the claim. If the appliance was truly faulty and malfunctioned, then the damage is covered. However, it should also be noted that replacing the appliance is not covered and must be paid for by the insured. Flooding caused by a leaking water heater follow the same guides as the leaking appliances. The insurance company will try to prove that the water heater was poorly maintained so that they can deny the claim. If they cannot prove that the water heater was poorly maintained, then the damage is covered. Again, the replacement of the water heater is not covered by the insurance claim and falls on the insured to pay for. Sometimes in the winter water gets trapped in the pipes and freezes. The frozen water trapped in the pipes has the ability to burst the pipes and cause flooding. The damage caused by this is covered only if the house was being lived in at the time of the flooding. if the insured can prove that heat was being maintained in the residence and that the water was turned off while they were away then the condition mentioned above does not apply and the damage is still covered. If flooding is caused by an overflow of the sink, toilet, tub, pool, or any other container of water the damage is covered. This is considered accidental and the insurance company would pay for the damages. When is the Flood Not Covered? Flooding caused by nature is not covered under a standard homeowner’s insurance policies. This type of flooding is only covered under flood insurance. However, even with flood insurance the coverage is limited. Flood insurance covers most personal belongings, appliances, and the structure. The best defense against flooding basements is to have a functioning sump pump. This pump works by pushing water out of its tank as it fills up with water. Effectively preventing a flood in the first place. Sometimes sump pumps fail though, and additional coverage can be bought to cover it. Again, this will have to be a proven malfunction and not failure due to poor upkeep. Eternal sewage systems can back up into homes. If this occurs to your home the insurance company will not cover the damages. Many insurance companies offer endorsements that cover up to $10,000 in damages. However, that is usually not enough to cover the damages as sewage backups cost the most to cleanup when they occur to a home. Additional coverage can be bought for over the $10,000. Generally, this is not covered by insurance companies. After heavy rains, water from the saturated ground can seep through the ground and enter the home. Insurance companies do not consider this a coverable disaster. This is also not covered in flood insurance unless it is directly related to a flood in the area. The best defense against this is to make sure that the foundation of a home is solid and up to date on all inspections. 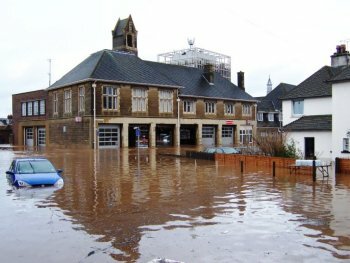 Have you had a loss at your house due to one of the covered versions of flood listed in this article? If so, request a free consultation with a public adjuster in New Jersey, PA, DE or MD by filling out a contact form on our website, or by calling 1(800) 410-5054 today.